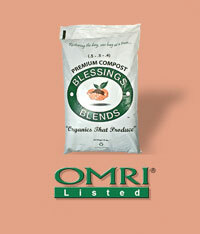 Amend soil with Blessings Blends OMRI-Listed Premium Compost (.5-.5-.4) before planting. Growing the vines in raised rows, known as hills, ensures good drainage and will hold the sun’s heat longer. If you are in a cooler zone, start seeds indoors about a month before transplanting. Watermelon vines are very tender and should not be transplanted until all danger of frost has passed. If you live in warmer climes, you can direct sow seeds outdoors, but wait until the soil temperature warms to at least 65 degrees to avoid poor germination. Space the plants about 2 feet apart in a 5-foot-wide hill. Give watermelon vines plenty of room to roam by spacing transplants 6 feet apart in rows 6 feet apart. If you’re growing Sugar Baby watermelon, which yields small fruit (8-10 pounds) on tidy vines, space transplants 4 feet apart. After transplanting, cover plants with floating row covers to exclude insects and trap warm air near plants. Watermelon vines bear male and female flowers. Don’t be alarmed when the male flowers, which open first, fall off shortly after they open; they are followed by female blossoms about a week later. The female flowers, which have a small swelling at the base of the flower, stay on the vine to bear fruit. When vines start to bear both male and female flowers, remove row covers. Tackle weeds before vines start to run because it will be difficult to move among vines at a later stage without crushing them. Mulching soil under vines suppresses weeds and slows moisture evaporation from soil. Water plays an important role in keeping vines healthy and producing delicious fruit. Vines are most sensitive to drought during the time from transplanting to when fruits start to form. Avoid overhead watering. Soaker hoses or drip irrigation deliver water directly to soil, preventing possible spread of fungal diseases among wet foliage. 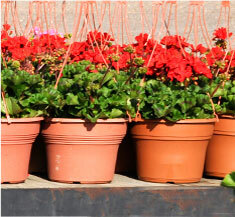 Keep soil consistently moist, but not waterlogged, which will kill plants. It’s typical for leaves to wilt under midday sun, but they shouldn’t remain wilted into evening. Water vines early in the morning so leaves can dry before sunset, which helps prevent fungal disease.